“Abisko”. Intermediate level dressage horse. Goal of treatment to improve performance. Abisko has been treated over the course of the last two months for mild to moderate thoracolumbar(TL) and sacroiliac(SI) pain. He has shown improvement in his SI comfort as well as increased mobility through his TL spine with treatment. Abisko is a 10 year old Oldenburg gelding competing in upper level dressgae. Abisko has a history of SI pain and dysfunction. Both SI joints have been treated with intra-articular corticosteroids; this has resulted in improved comfort and increased performance. No other significant medical history, treatments, or joint injections have been performed. This horse has no surgical history. He does not receive any medication, but does utilize a BEMER blanket on an ongoing basis. (BEMER is a blanket that provides pulsed electromagnetic field therapy). Owner reports Abisko can become very stiff through the bit and heavy on the forehand. There is a lack of impulsion noted in his hind end that is more noticeable at the canter. He is worked 4-5 days per week, turned out in a large dirt paddock daily, and is ridden on trails including steep hills 1-2 days per week. Abisko was found to have normal vital signs and a body condition score of 6/9 with adequate and symmetrical muscling with no significant conformation abnormalities. No obvious signs of lameness or ataxia noted when evaluated at a walk and trot in hand. On myofascial palpation exam he exhibits bilateral TMJ pain, trigger points in left sided triceps and bilateral pectoral muscles. Noted reduced mobility through his caudal thoracic and lumbar spine, with marked sensitivity to manual pressure over the SI joint/tuber sacrale, more notable on the right as compared to the left. He has numerous trigger points along his inner bladder line, beginning at the 14th intercostal space and extending through the caudal sacral region. There is no stifle or tarsus effusion, but he does exhibit hyper tonicity and trigger points through his middle gluteal muscles. No hock or stifle effusion. I designed my acupuncture treatment plan to primarily address the thoracolumbar and sacroiliac pain identified both during my exam and as historically reported for this horse. As there was also pain identified in other regions (TMJ, triceps trigger points), I included those in my treatment plan as well. I relied on the basic principles of acupuncture (reduced nociceptive input to spinal cord, local release of endogenous opioids, muscle relaxation of trigger points) to provide pain relief, with the goal of treatment being to reduce pain and maladaptive gait abnormalities leading to increased performance. 1. Hock pain 2. Stifle pain 3. Suspensory ligament desmopathy 4. Sacroiliac pain 5. Lumbosacral dysfunction. Pain localized to any of these regions in a sport horse could create either hind limb lames, or reluctance to fully engage the hind end while working. The history and exam findings were most supportive of sacroiliac and thoracolumbar pain as the cause of reduced performance and hind end engagement. The lack of hind end lameness and negative flexion tests is less consistent with hock, stifle or suspensory pain. He was worse under saddle, and more affected at the canter than the trot, and his clinical signs were also insidious in onset. Interestingly, he was given to his trainer rather than sold by his former owner due to behavioral issues (rearing, bucking). In many horses with SI pain, these are interpreted as primary behavioral issues rather than related to SI pain. Treatment 1: Primarily 0.2 x 30mm J type Seirins were used in all treatments. This horse has thus far been exclusively dry needled. Treatment 1 consisted of GB 21 and LI 16 as test points for needle tolerance. SI 11 and SI 12 along with triceps trigger points were selected for the identified left sided triceps pain. Bai Hui, BL 19, BL 21, BL 23, BL 25, BL 30 were selected for thoracolumbar and sacroiliac pain. GB 29, 30 and BL 54 were selected due to presence of middle gluteal pain and hyper-tonicity. BL 39 was placed but removed, as Abisko was not tolerant of this point. No distal limb points were tolerated. Treatment 2: Sam points as above, with addition of ST7 and SI 18 for TMJ pain. LU 1 was treated for pectoral soreness. ST 36 was treated as a distal pelvic limb point as well as for general anti-inflammatory properties. BL 10 was selected for suspected cranial cervical pain related to the sore TMJs and tendency to get above or behind the bit. BL 20 and 27 were also treated for the thoracolumbar and SI pain. Treatment 3: Attempted to place same points as in treatment 2, but was not tolerant of ST7 or any distal pelvic limb points. The myofascial palpation exam was repeated following each treatment. Reduced sensitivity was noted in the thoracolumbar and SI region, as well as increased mobility through the thoracolumbar spine. I attributed these effects directly to acupuncture therapy as no other modalities had been employed. 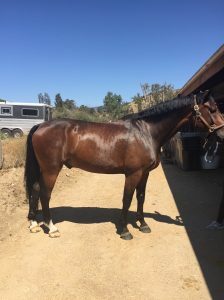 Owner reports mild improvement in acceptance of the bit and some increased engagement of hind end along with smoother transitions between trot and canter. As horse is not receiving any other additional medical or complementary therapies, I attribute a reduction in pain from the acupuncture therapy as responsible for these improvements in training and performance. While a reduction in workload may be of benefit to this horse, it is unlikely that will be possible with the current competition schedule. 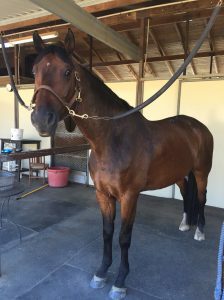 As this horse was given away rather than being sold due to his prior behavioral issues, I think it is important to consider the role of his TL and SI pain as the cause of his rearing and bucking. I hope to continue to improve comfort in these regions, and will be following the case closely along with his regular DVM to see if we also appreciate concurrent improvement in these undesirable behaviors. 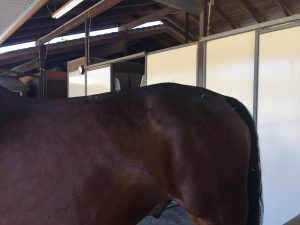 This case has given me a greater appreciation for the role that acupuncture can play in treating chronic musculoskeletal pain in performance horses, especially in regions that have been traditionally difficult to identify and treat, such as the SI joints.